It’s not a surprise that Gov. Michael J. Dunleavy’s plan to rollback much of Senate Bill 91’s criminal justice reform will put more people behind bars, but the price tag seemed to come as a surprise to the Senate Judiciary Committee during its Wednesday hearing on Senate Bill 32. 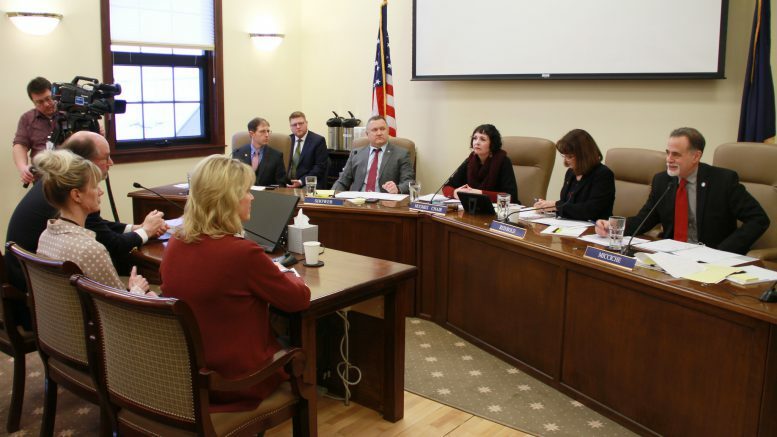 The bill makes a load of changes to how Alaska penalizes crime and is expected to increase the Department of Corrections’ budget by $41 million every year in perpetuity. A few examples: Increasing the presumptive range for class A misdemeanors are expected to increase by sentences by average of 9.7 days and cost the state $8.2 million a year; increased sentences for C felonies will collectively cost $11.9 million a year; tougher penalties for violating conditions of release is expected to cost the state $5.7 million a year. While Juneau Democratic Sen. Jesse Kiehl was asking what evidence there was that these would actually reduce crime (there wasn’t), the rest of the committee spent much of the meeting justifying the increased price tags of repealing a bill that everyone acknowledged isn’t the prime driver for the spike in crime. Sen. Lora Reinbold, R-Eagle River, also argued that Senate Bill 91 (which, again, everyone acknowledged wasn’t solely responsible for the uptick in crime) really shifted the costs of criminal justice to the people through stolen cars, damaged property and emotional trauma. It was a point that Attorney General Kevin Clarkson was happy to drive home. “I don’t know that anyone can sit here and guarantee to you that these changes will have the guaranteed effect of changing these crime rates,” he said. Of course this comes at a time when the Dunleavy administration has said prison privatization is on the table, and it just so happens that state budget director Donna Arduin has ties to one of the country’s largest private prison companies. Democrats have already raised these concerns, pointing out that her financial disclosure doesn’t dive deep enough to show whether her consulting firm has any contracts with GEO Group (where Arduin worked as a lobbyist and corporate board member). Prior to Senate Bill 91 and other criminal justice work by former Gov. Bill Walker, Alaska shipped some of its inmates out to Outside private prisons. The distance raised concerns about severing a person’s ties to Alaska as well as serving as an avenue for Outside gangs and other criminal influences to reach Alaska. Private prisons also happen to frequently push for tougher sentencing rules as it helps fill beds. The administration’s stated commitment to helping rehabilitate inmates should also be in question after the administration turned down a $1 million federal grant for re-entry programs. We’ll likely find out whether this is really in the cards on Feb. 13, when the governor will finally release his budget. The Senate Judiciary Committee also briefly touched on the Justin Schneider case from last year where through a combination of a plea deal and existing sentencing laws allowed him to get a no-jail sentence for kidnapping, strangling and masturbating onto a woman. Department of Education and Early Development Commissioner Michael Johnson was up in front of the Senate Finance Committee on Wednesday for a hearing on his selection as successor for the lieutenant governor. Things got dodgy when Johnson was asked on his position on school vouchers, particularly for private religious schools. The Alaska Constitution explicitly bans such a practice, but it was one of the few legislative priorities of Sen. Mike Dunleavy. Johnson refused to ever really give his personal opinion on the matter, saying it was all prevented by the constitution. He said it should be a discussion for the people, which is how Alaska’s constitutional amendment process already works. 2 Comments on "AKLEG Day 23: Criminal justice rollback would cost Alaska’s prisons $41 million more every year"
Then they multiply that cost for man days to arrive at their fictitious “42 mil” increase!! The infistructure is already in place!! The only cost increases are for a few pennies a day fir electricity and a couple of bucks for food!! Administration’s just trying to grow their budgets to hire more special assistants and such! Do u really think if an institution houses one more inmate they get that 50k?? It’s like they keep 3 sets of books for accounting! !